If it's Friday we must be back in London. Every Friday I take a virtual walking tour ‘above ground’ on the London Underground. Using my Tube guide & my fitbit® device, my goal is to walk 10,000 steps a day roughly following along the Underground route, reporting back here on Fridays with my findings We're currently following the Central Line. Here are the previous days. This is Day 54. Following the Central Line from where left off last week's visit to the Roman Ampitheater at Guildhall , as we walk from the Bank Station along Old Broad Street to Liverpool Station, we can't miss the towering Gherkin rising almost 600 feet in the air. Today it’s definitely a case of a picture being worth a thousand words otherwise how could I describe this tall pickle-shaped building—a missile comes to my mind—clad in glass? 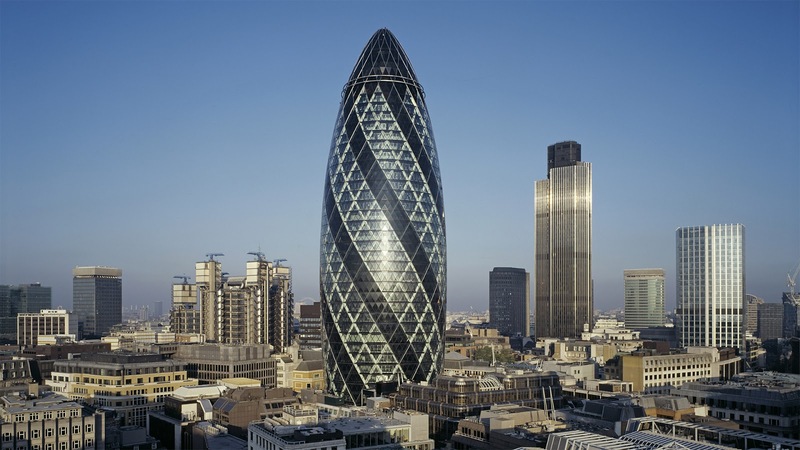 Located at 30 St. Mary Axe—Oh, I do love these odd British names that make you go huh? Why is the street called St. Mary Axe? Did St. Mary have one?—the tower opened in 2004. Billing itself as the most civilized tower in the world in the world, the 41 storey Gherkin was built in place of structures damaged by an IRA bomb in 1992, when plans for the 92 storey Millennium Tower were axed. But enough facts, let’s see what all’s inside. 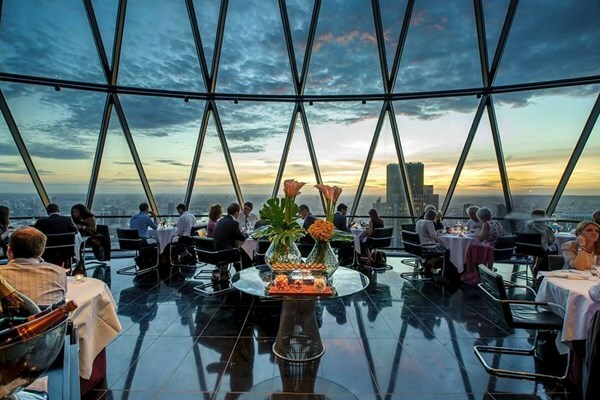 There are several eateries at the Gherkin but let’s face it, the action is all at the top of the Gherkin's glass dome where we find The Sky Restaurant. The panoramic view is a spectacular, the Thames and London skyline glittering beyond. But wait. We can only see it from the outside via pictures like the one posted above. This view is very exclusive, the restaurant is open only to members of the private club or tenants of the Gherkin! I find I’m not only disappointed to learn the restaurant is open only to those special few except “at selected points in the year” where the restaurant hosts “a few special ‘Open nights’ available to the public” I’m shocked. Imagine the city planners, the men who decide what gets built and what doesn’t, deciding to put up a building entirely out of keeping with the rest of the city, a building that asks you to make fun of it, to love it or hate it, granting permission and rather than insisting the price the builders pay be that the top floor restaurant be available to anyone who can pay the price, granting permission to limit the privilege only to those of privilege. They pride themselves on handpicking their members. Of course, they do. Except, of course, for those scattered few days throughout the year when the hoi polloi are allowed. Frankly, I find I’m not at all interested in reaching the top. Or even exploring the Gherkin—although to be honest I do find the architecture intriguing. The idea of noblesse oblige, of being granted access strikes me as undemocratic, reminding me of the way the upper classes have always treated those that serve them. The British holiday ‘boxing day’ derives from the custom—so saintly, so generous—of the wealthy giving their servants—who would have been unable to celebrate with their own families on Christmas Day because they were serving them—a box of gifts, money and leftovers which they could take home the day after Christmas. About that name? The street gets its name from the medieval church that once sat at the end of the street—"St. Mary, St. Ursula and her 11,000 Virgins’’—shortened to St. Mary Axe because the church had an axe over its east end. The reference is to the legend of St. Ursula who, while returning from a pilgrimage to Rome with 11,000 virgins, was slaughtered for refusing to marry a Hunnish chief in 451 AD. To make sure women everywhere got the message, all 11,000 virgins were beheaded too! Crimony! We have come a long way, baby! But as evidenced by private clubs like Searcy’s at the top of the Gherkin, the world still hasn’t come far enough. In my view. Which doesn’t include the top of the Gherkin. I adore the Gherkin – I always look for it when the London skyline shows up in movies. I think I’d rather not go to the exclusive restaurant. It might be a nice view, but it wouldn’t have the Gherkin in it, after all. Good point Joy! It does bring a certain elan to the landscape. Another wonderful tour. Love your comments. Of course, peasants still have to be kept in their place - if not, where would we be?! All the best to you and yours for a lovely Christmas and a fabulous New Year. You sir are very kind, all the best to you and yours as well!